Since DeTour Reef Light sits approximately two-thirds of a mile offshore in 24’ of water, it cannot be reached by land transportation. It is located in northern Lake Huron near the mouth of the St. Mary’s River at the far eastern end of Michigan’s Upper Peninsula (see maps below). The closest communities are DeTour Village (www.detourvillage.com ) on the mainland and Drummond Island (www.drummondislandchamber.com ) which is reachable by a ferry boat ride from DeTour Village. 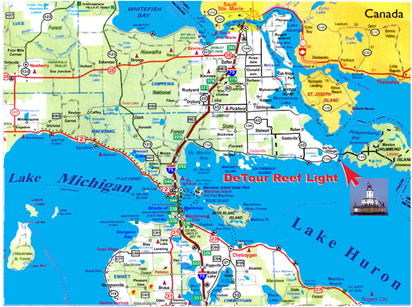 To get to DeTour Village from southern Michigan by car, go north on I-75, cross the Mackinac Bridge and travel 15 miles north to exit #359 then turn right eastbound on Michigan Highway #134 for 41 miles. If coming from the north on I-75, take exit #359 and follow the signs to DeTour. The ferry boat to Drummond Island, which takes cars and trucks, leaves every hour, 22 hours a day and takes about 10 minutes. For the latest ferry schedule and fees, visit the Eastern Upper Peninsula Transportation Authority website and choose Drummond Island Ferry. The closest airports with commercial service (Northwest Airlines from Detroit) are Pellston Regional Airport (79 miles) and Chippewa County International Airport (47 miles). Rental cars and shuttle service are available at both airports. Airplanes can land at the Drummond Island Airport which has a 4,000 foot lighted runway. The best way to get to the DeTour Reef Light (and the only way to actually get on it) is to take a boat tour operated by DRLPS. Otherwise you can go view the lighthouse from either your personal boat or a charter boat. However, if you are not part of an official DRLPS tour or an authorized volunteer, you cannot actually go on the lighthouse property. If you choose to view the lighthouse from your own boat or a charter boat, the GPS coordinates of the lighthouse are 45°56’56.12″N, 83°54’10.98″W. Presently, a public view of the lighthouse from shore (three miles) is at the ferry dock on the Drummond Island side. Also, the Historical Marker for the DeTour Reef Light, located on M-134 five miles west of DeTour Village, offers an impressive view of the lighthouse (four miles). There are other good views from shore (as close as two-thirds of a mile), but they require permission from private property owners. In the future, DeTour Village hopes to develop a waterfront park that will provide a good view (three miles).